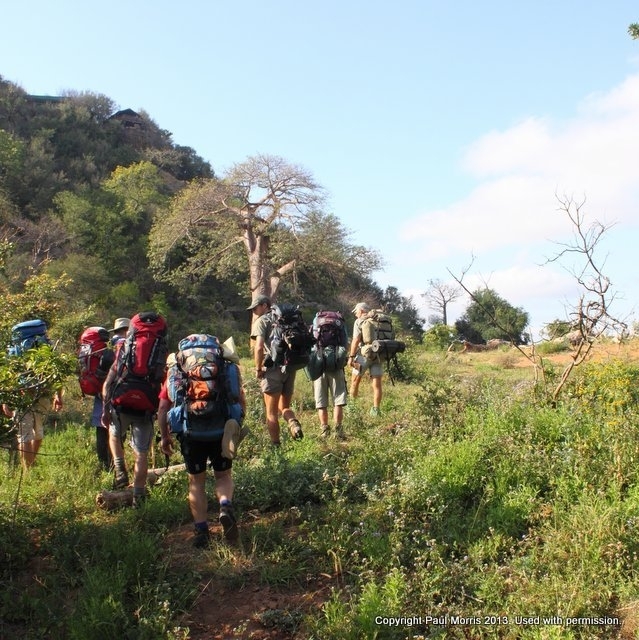 The Makuya slackpacking trail will take you through the beautiful Makuya Reserve. The area plays host to a series of mountains, rivers, plains and gorges. The interpretive trail will see a hikers spending time discussing the ecology of this wilderness area. The hike is suited to physically fit people who wish to learn first- hand about the area. 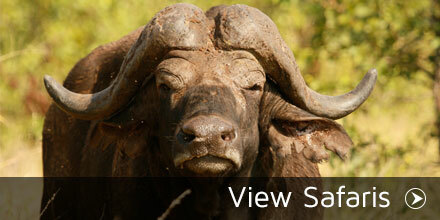 There is also an opportunity to see a variety of birdlife as well as the alluring Big 5. This trail is completed over 5 nights. Today you will meet your guide at the Singo Safari Lodge which will play host to your first night’s stay. Your en- suite safari- tent overlooks the glorious Luvuvhu River. Your guide with prepare your first night’s dinner while you sit around an open fire discussing the journey ahead. Vehicles will remain parked at this lodge for the duration of the trip. We will leave early morning to take in the beauty of first light. 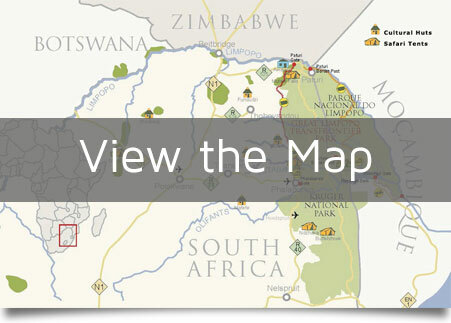 The route will cover roughly 10 km’s of relatively easy walking along the Luvuvhu River. in January 2013, the floods washed much of the riverine vegetation away. We may come across 4×4 vehicles, fisherman an local people as this part of the trail is the least “wilderness in nature”. There are also many safe places to swim in the river. You are advised to carry a day pack consisting of drinking water, binoculars, and a camera. The rest of your kit will be portered to Pandembile. Your hike will allow you to enjoy the natural beauty of the area as well the exceptional wildlife that the region has to offer. Around mid- afternoon, you will arrive in Pandembile where there will be dome tents set up in the rough bush area. Tonight you will have the opportunity to dine under the stars and fall asleep to the sounds of the African bush. Your journey will take you through Luvuvhu Gorge today. 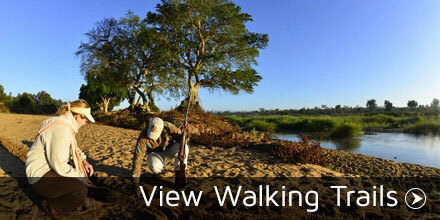 We start with a 7 km walk along the Luvuvhu River. If the level of the river is suitable, we may have the opportunity to relax in the pools at Potholes. The route today traverses for a few kilometres through plateau sandveld vegetation before heading back down a steep elephant path in the heart of the gorge. The route today offers some spectacular views and is the most technical with some very steep sections. Accommodation for the night will be in the heart of the Luvuvhu Gorge where there will a safe place to swim. We enjoy bush camping on this night. We will embark on 5 km route out of the gorge and through the plateau sandveld and to the Nyanada campsite close to the Nyanada Mountain. The landscape changes dramatically today as we enjoy a variety of unique vegetation. The route is fairly short today which allows for time to explore before we arrive at Nyanada campsite. We spend this night at Nyanda camp which offers bush camping facilities. Water will have to be provided as there is no river. Today we hike for roughly 10 km’s along the drainage line at the base of the sandstone cliffs. We then transverse mopane vegetation to Mutale River and then along the river to Mutale Falls. There will be an opportunity to swim here in safe zones. We spend our last night in the comfort of Mutale Falls Lodge which offer en- suite safari tents. This trail is also available as a backpacking trail where hikers will need to bring their own food and camping equipment. Those who choose this option are advised to be fit and healthy as the trail is fairly strenuous. The Makuya reserve is located in the north- east of South Africa. It is situated between Punda maria and Pafuri and is unfenced on the western side of the Kruger National Park. Summer in the area can get excessively hot and therefore the trail only runs towards the end of April to September. An intermediate level of fitness is required for the hike as some sections are steep and may become tricky. Your hike is fully serviced and includes secure vehicle parking. The minimum size for the group is 4 people, with a maximum of 8 hikers. The slackpacking trail requires hikers to provide their own sleeping bag for camping nights. Food, cooking and camping equipment will be provided and portered during your hikes, so there is no worry about extra luggage. The supply of water during the hike will be limited so it is best to bring extra water purification tablets should you require them. The hiking trail includes secure vehicle parking, accommodation, all meals, snacks and drinking water. Your items will be portered and you will be taken back to your vehicle/s at Singo Safari Lodge. You will need to supply your own vehicle for the bush camping night. You are advised to consult your medical practitioner for the correct prophylactics. Makuya Reserve is in a malaria area and hikers are responsible for their own travel insurance and/ or medical evacuation insurance.